HOLLYWOOD, CA, October 5, 2006 — The 10th Annual Hollywood Film Festival(R) and Hollywood Awards®, co-chaired by Paula Wagner and presented by STARZ, will honor THE FILM FOUNDATION with its “Hollywood Film Preservation Award” and Academy Award winner BEN AFFLECK with its “Hollywood Supporting Actor of the Year Award.” The awards will be bestowed as part of the Hollywood Awards Gala Ceremony on Monday evening, October 23, at the Beverly Hilton Hotel in Beverly Hills. THE FILM FOUNDATION, the most prominent film preservation organization in the United States, was born out of the recognized need for a single influential entity to take the lead in advocating and supporting the preservation of our nation’s cinematic heritage. The nonprofit group was founded in 1990 by Martin Scorsese and a distinguished group of fellow filmmakers — Woody Allen, Robert Altman, Francis Ford Coppola, Clint Eastwood, Stanley Kubrick, George Lucas, Sydney Pollack, Robert Redford, and Steven Spielberg — all dedicated to protecting motion pictures and the rights of the artists who create them, educating the public about the importance of film preservation, and raising the necessary funds to save the endangered cinematic treasures of the 20th century. The Film Foundation achieves these goals through innovative educational programs, national campaigns, and public events. Over the past 16 years, through partnerships with the nation’s leading film archives — the Academy Film Archive in Los Angeles, the George Eastman House in Rochester, New York, the Library of Congress in Washington, D.C., the Museum of Modern Art in New York City, and the UCLA Film and Television Archive in Los Angeles — the Film Foundation has funded the “hands-on” preservation and restoration work of more than 450 films that were facing an imminent risk of being lost. In addition, the Film Foundation works with the National Center for Film and Video Preservation at the American Film Institute, and supports the National Film Preservation Foundation, which represents over 100 regional archives, libraries and historical societies. The films saved include a broad and exciting range of titles, including Hollywood features, silent films, newsreel footage, and documentaries, as well as independently produced and avant-garde works whose survival is equally as vital, but which would be lost without specialized support. The cultural institutions supported by the Film Foundation provide U.S. and international communities with essential access to the immeasurable wealth of our cinematic heritage. In recognition of the importance of exposing future generations to classic cinema, the Film Foundation created The Story of Movies project, the first-ever integrated interdisciplinary curriculum for the study of the cultural, artistic, and historical significance of film. This program is available free of charge to middle schools across the country, with a goal of teaching young people how to understand and interpret the language of film and visual images. Each teaching unit includes DVDs, a teacher’s guide, and a student activities booklet, providing an in-depth exploration of classic films such as Robert Mulligan’s “To Kill a Mockingbird” (1962), Frank Capra’s “Mr. Smith Goes to Washington” (1939), and Robert Wise’s “The Day the Earth Stood Still” (1951). 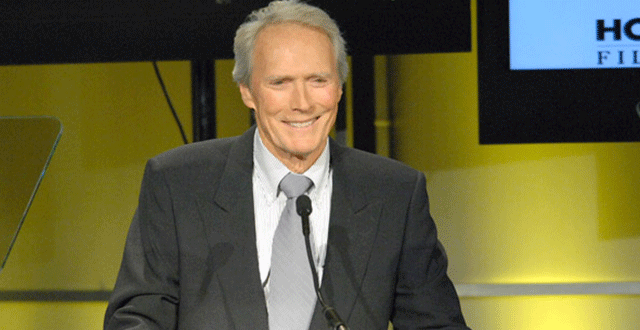 PICTURE: Film Foundation board member Clint Eastwood accepts the Preservation Award on behalf of the foundation at the Hollywood Awards event.